﻿ Brie En Croute - Merwanjee Poonjiajee & Sons Pvt. Ltd.
Dust work surface with a little flour. Unfold pastry & cut 4 6" * 6" squares. Depending on brand, dough may have to be rolled out slightly to achieve 4 squares. Lightly brush each egg white on top surface of each square and all sides of cheese. Place 1 Tbs p. chutney in center of each square, top it with cheese. 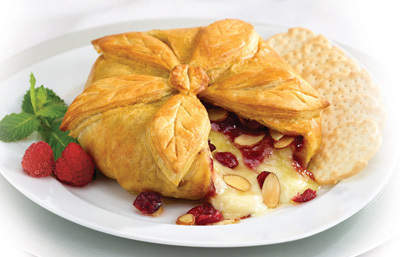 Gently fold pastry over cheese to enclose, seal seams. Place on parchment lined jelly roll pan. Beat yolk with 1 cheese. of water. Lightly brush top & sides of pastry. Bake pastry is golden & baked thorough. Let it cool for 5 minutes and serve.